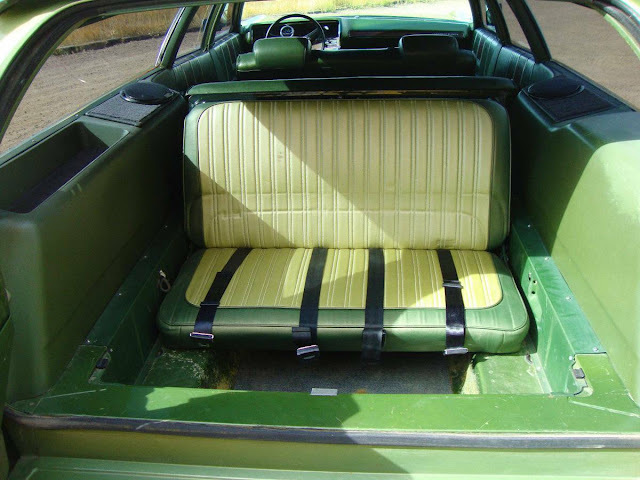 This next car reminds us what a big thing avocado green was in the early 70's. Kitchen countertops, appliances, deep shag carpet, and Mopar Wagons. Make all of your friends green with envy after you whip out a major pile of kermit green cash to pay the asking price on this thing. 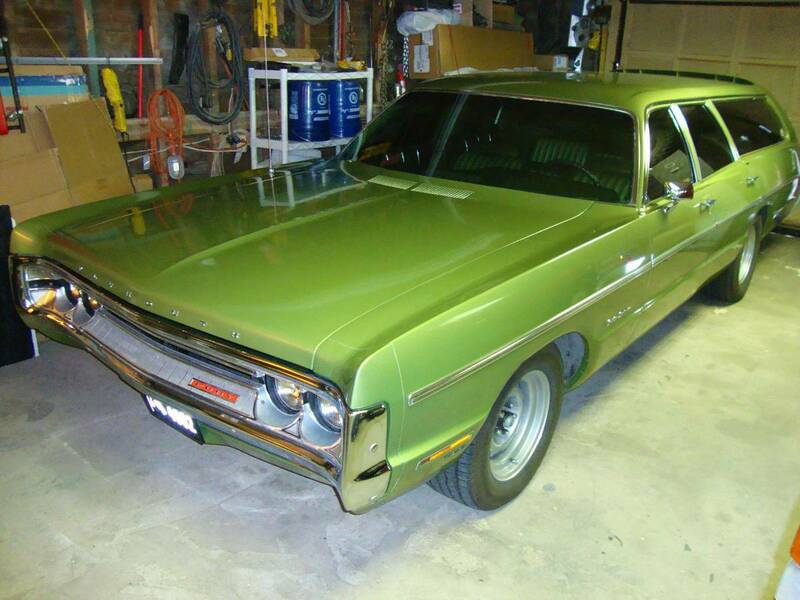 Find this 1971 Plymouth Fury Custom Suburban Wagon offered for $17500 in Colorado Springs, CO via craigslist. Tip from FuelTruck. Rare 1971 Plymouth Fury Custom Suburban Wagon, 50,120 original miles, pristine condition, absolutely no rust, BFG TA radials on Mopar Rally wheels, Edlebrock intake manifold, 4 B Holley carb, original 360 engine, sanderson Block hugger headers with dual exhaust, Flow Master mufflers, and Magna Flow exhaust tips, 4 new Napa shocks, recent front end alignment, new brake master cylinder, 727 transmission recent professional rebuild approximately 700 miles ago, PS, PB, stereo includes blue tooth, IPod connector, Sirius XM, CD, amp, and sub-woofer, Bosch Retro tachometer from JEGS, hand stitched leather wrapped steering wheel, all windows have been tinted dark. Sold new to original owner in Billings, Montana, second owner in Bozeman, Montana, third owner in Laramie, Wyoming, I am the fourth owner, original owner's manual, brochure and a folder of receipts totaling over $6,000 of upgrades that have been done to this car within the last 4,700 miles original parts from the car's upgrades, such as intake manifold, carburetor, air cleaner, valve covers, exhaust manifolds, fan, rear storage compartment metal folding cover, AM radio, speaker and some extra head lamps and wiper blades will be included, recent lube job and oil change, car is a rare find, $17,500.00 CASH! Wow, that is really.............. green. 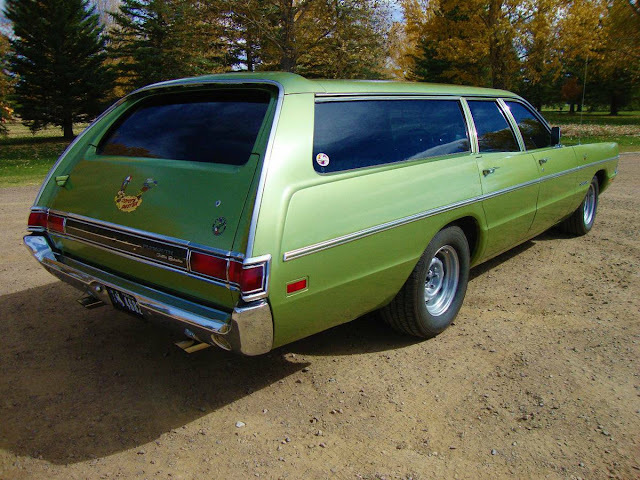 OMG, that is really barf green and I am a lover of wagons! But rare and very clean does not make it valuable or attractive to me. I would have trouble paying that much for it no matter how rare and an AM radio??? Cool ride, but I don't see that bringing anywhere near that kind of money unless he runs across someone who wants it because the color matches his 70's kitchen appliances. $17,500?? There are a lot of other cars I would rather buy at that price. Why is this rig listed in Austin, Texas, but daily turismo says it is located in Colorado? With Wyoming license plates on the car? Yeah...there could be some funny business with this advert -- the car is listed on Austin craigslist, but the location is listed as "Colorado Springs" and the plates are Wyoming...and pics make it look like fall in Colorado or Wyoming if you ask me. Funny , It has a 1970 Plymouth Road Runner Coyote Duster Air Cleaner Decal and a Superbird decal on the tailgate.